We’d love your help. Let us know what’s wrong with this preview of The Little Orphan Girl by Sandy Taylor. To ask other readers questions about The Little Orphan Girl, please sign up. Thank you to the publisher Bookouture who provided an advance reader copy via NetGalley. When I saw a new book available from author Sandy Taylor I jumped at the chance to read it. I had read her wonderful book "The Runaway Children" last year and was deeply moved and impressed by it. I can thankfully say that her latest offering did not disappoint, for this is another exquisitely written and very special story. In 1901, six-year old Cissy Ryan is leaving the workhouse in Ballybun, Ireland with a Thank you to the publisher Bookouture who provided an advance reader copy via NetGalley. In 1901, six-year old Cissy Ryan is leaving the workhouse in Ballybun, Ireland with a mammy she never knew she had. She had thought she was an orphan named Martha. She loved growing up in the workhouse with Mrs. Foley who looked after her, and she was very best friends with fellow orphan Nora. Now "Cissy" was leaving with her rather cross (but pretty) mammy, being driven by horse and carriage to one of the little white cottages in Paradise Alley. When she first saw the granddaddy he too was cross, and he looked like the devil as he sat in his chair by the fireplace. Cissy thought he smelled like a dead ferret. Cissy is a very precocious and God-fearing little Catholic girl. Although she loved her former life in the workhouse, she settles in and grows to love her life in the close-knit community of Paradise Alley. She loves riding the horse and buggy with kind and handsome Colm, who is six years older than Cissy and works delivering milk to the surrounding area. He lives just down the street in the nice big gray house with his widowed daddy. Cissy Ryan (formerly known as Martha in the workhouse) was six years old when the mammy came to collect her. She had thought herself to be an orphan – the only home she’d known was the workhouse. So, when the mammy took her to a little run-down house in Paradise Alley which also housed the devil himself (which turned out to be the granddaddy), she was a little frightened. She wanted to return to the workhouse and her best friend Nora. It was 1901 and there wasn’t much money to be had in the smal Cissy Ryan (formerly known as Martha in the workhouse) was six years old when the mammy came to collect her. She had thought herself to be an orphan – the only home she’d known was the workhouse. So, when the mammy took her to a little run-down house in Paradise Alley which also housed the devil himself (which turned out to be the granddaddy), she was a little frightened. She wanted to return to the workhouse and her best friend Nora. It was when Cissy went into service at the nearby Bretton Hall that her life changed. She made some friends, but there were enemies around as well. What vast changes would Cissy have to make? Her love of Ireland encompassed her – but would she have to give it all up? The Little Orphan Girl is my third by author Sandy Taylor and I loved it as much as the previous two. A wonderful, although heartbreaking story, which was filled with hope, friendship and family – and the sadness which was caused by certain people who just can’t help being nasty, mean and vindictive. Cissy is a well-crafted character, kind and caring even in the face of adversity. Highly recommended. I think the author put research into this story and developed an interesting plot. I appreciated that it was about poor Irish Catholics rather than an upper class. It did a decent job with living conditions, attitudes towards unwed mothers, speech and showing different aspects of daily life (not stellar but decent — effort was certainly there). However, I cannot say I enjoyed this much. It was told from the first person POV, which is not one I enjoy much, but it was also a very weak narrative. Nearly all of the plot movement and important information was told through dialogue. It was pages and pages of dialogue. I skimmed through and scanned more than half of this book and I was still able to follow and understand what was happening. Overall, this wasn’t a very compelling read for me. What parts that I found of interest were marred by the narration style. I didn’t really enjoy the heroine much, mostly too good to be true, but when she gets in a spot of trouble, she makes a strange choice to hide her problems rather than placing her trust in the people who love her. I fell in love with Cissy's character as soon as we are introduced to her. I couldn't imagine life in a work house, especially at such a young age. I have to admit to being slightly worried when her mammy shows up to take her home. Having never known her mammy, it's obvious Cissy doesn't know quite what to make of it all. I didn't need to worry though as it isn't long before we get to see this little family come together. The story has a feel of Catherine Cookson about it which I loved. A fabulou I fell in love with Cissy's character as soon as we are introduced to her. I couldn't imagine life in a work house, especially at such a young age. I have to admit to being slightly worried when her mammy shows up to take her home. Having never known her mammy, it's obvious Cissy doesn't know quite what to make of it all. I didn't need to worry though as it isn't long before we get to see this little family come together. The story has a feel of Catherine Cookson about it which I loved. A fabulous rural setting where we get to see the differences in the working classes. I have to admit I am so glad I wasn't brought up in that sort of era. It makes for fascinating reading though and the author transports the reader into Cissy's world of working up at the big house and the hustle and bustle of the goings on and the workers. I could picture it all vividly in my mind. There are lots of wonderful characters throughout this story. Colm being one, who a very young Cissy decides at a very young age that he is the man for her. I loved her innocence and sweetness and as I got to know Colm, I could easily understand the young girl's crush. The Little Orphan Girl is an enthralling read that I didn't want to put down. I was so wrapped up in what was going on in Cissy's world that I ended up reading the book in two sittings. The author takes her readers on an emotional journey with lots of highs and lows. Many a time I had to take a quick breather to compose myself before my emotions threatened to take over. A heart warming and beautifully written story that will have you hooked until the very last page. We all know I have a handful of ‘go-to’ favourite authors who I can rely on to write a novel that will test my emotions and fill my heart with joy at the same time as tears cascade down my face and Sandy Taylor is one of those. She writes with such a beauty so that the characters creep in under your skin and the reader becomes one with them. The descriptive writing that creates the atmosphere to such an extent that I can ‘see’ what is happening. This is the story of Cissy a lovable little orphan We all know I have a handful of ‘go-to’ favourite authors who I can rely on to write a novel that will test my emotions and fill my heart with joy at the same time as tears cascade down my face and Sandy Taylor is one of those. She writes with such a beauty so that the characters creep in under your skin and the reader becomes one with them. The descriptive writing that creates the atmosphere to such an extent that I can ‘see’ what is happening. This is the story of Cissy a lovable little orphan who is removed from the workhouse by Mammy. But who is Mammy? It’s a story of not much money in the days of the early 1900’s and how families cope. It’s an innocent age in some ways but also shows an element of what can go on. The fact that most people help each other and no matter how bad things seem a cuppa will always sort it! As we follow Cissy through her life we are drawn into all the drama high and low, I loved watching her grow and became so engrossed in the book it didn’t take me long to read it. I’m not going to give any secrets away, this is a book that deserves to be read from the beginning and enjoyed by many. The Little Orphan Girl is a beautifully written emotional story of romance, hardships, heartbreak and the innocence of youth. As with other books from this author, the characters are stunning and I can’t help loving them. I loved following the adorable Cissy Ryan from a six year old, leaving the workhouse orphanage when her real mammy arrives to claim her and take her home to her mean spirited granddaddy and Cissy’s blossoming friendship with Colm Doyle and his horse Blue show Cissy that kindness The Little Orphan Girl is a beautifully written emotional story of romance, hardships, heartbreak and the innocence of youth. I loved following the adorable Cissy Ryan from a six year old, leaving the workhouse orphanage when her real mammy arrives to claim her and take her home to her mean spirited granddaddy and Cissy’s blossoming friendship with Colm Doyle and his horse Blue show Cissy that kindness and laughter is possible, even in the hardest of times. I highly recommend this fantastic book as well as reading this very talented author’s previous books, you won’t be disappointed. From the get go this book had me hooked! The coarse Irish banter had me laughing and I felt a connection with the characters right away. Six year old Cissy lives in a workhouse in County Cork Ireland in the 1900's. One day her mum decides to claim her and take her home to live with her grumpy grandaddy in Ballybun. The story takes you through Cissy's school life where she meets and befriends people that become very dear to her heart. Upon finishing school, Cissy begins her first job as a servant From the get go this book had me hooked! The coarse Irish banter had me laughing and I felt a connection with the characters right away. Six year old Cissy lives in a workhouse in County Cork Ireland in the 1900's. One day her mum decides to claim her and take her home to live with her grumpy grandaddy in Ballybun. The story takes you through Cissy's school life where she meets and befriends people that become very dear to her heart. Upon finishing school, Cissy begins her first job as a servant in Bretton Hall. Cissy faces many bumps in the road as she transitions from child to young lady. Heartache and tears, laughter and love. This book definitely encompasses a lot of emotion and is beautifully written! This is the first book I have read from Sandy Taylor and definitely won't be my last! I felt that the title didn't really match the story but other than that a fantastic read. We first meet Cissy Ryan when, at the age of six, she leaves a workhouse holding the hand of a woman claiming to be her mammy. The workhouse for orphans is the only home Cissy has ever known and her mammy isn’t quite the kind of mother she expected. In fact Cissy was sure her name was Martha and she didn’t even have a mammy. Nevertheless, Cissy moves in with her mammy and her grandfather, a grumpy old man, in a tiny cottage. Life is suddenly very different but there is a silver lining and his na We first meet Cissy Ryan when, at the age of six, she leaves a workhouse holding the hand of a woman claiming to be her mammy. The workhouse for orphans is the only home Cissy has ever known and her mammy isn’t quite the kind of mother she expected. In fact Cissy was sure her name was Martha and she didn’t even have a mammy. Nevertheless, Cissy moves in with her mammy and her grandfather, a grumpy old man, in a tiny cottage. Life is suddenly very different but there is a silver lining and his name is Colm Doyle. The Little Orphan Girl by Sandy Taylor. 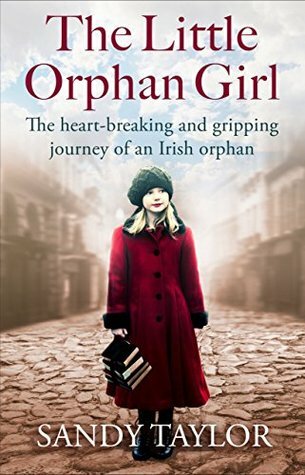 This book is fully titled The Little Orphan Girl: The heartbreaking and gripping journey of an Irish orphan. Please don't let that put you off reading this book. Personally, I don't like books that can break my heart, but there was just something about this one that made me decide to break my usual rule of only reading 'happy' books and I am so glad that I did. Cissy Ryan is just 6 years old when the story begins. She has lived all of her life in a workhous The Little Orphan Girl by Sandy Taylor. Cissy Ryan is just 6 years old when the story begins. She has lived all of her life in a workhouse, then suddenly one day a woman she doesn't know but who says she is Cissy's mother, comes to get her. Cissy thinks she is just going for a day out with the woman, but instead she is taken to a run-down old house where her very smelly grandfather lives and is told that this will her home from now on. Cissy misses her friends in the workhouse but soon enough comes to terms with her new life with her real family. From there the story develops as she grows up and we see the trials, tribulations plus happy times that Cissy has. There are some very funny moments such as the times when Cissy is more outspoken than perhaps she should be, there are sentimental moments, and there are, yes, heartbreaking moments. I don't think I have ever cried so much reading a book. BUT don't fret, despite the hardships she endures, Cissy will have her happy ending, and it makes all that she has gone through worth it. Oh WOW Sandy Taylor has done it again. What a beautiful heart-warming story this is set in Ireland. Five-year-old Cissy Ryan has lived all her life in The work house. She thought she was an orphan until her mother, who was also in the work house. Takes her a leaves and go to live in a cottage with her granddaddy. She meets Colm who drives the milk cart with his horse Blue. There is an instant connection between the two and they become great friends. Cissy develops a crush on Colm. But, as Colm g Oh WOW Sandy Taylor has done it again. What a beautiful heart-warming story this is set in Ireland. Five-year-old Cissy Ryan has lived all her life in The work house. She thought she was an orphan until her mother, who was also in the work house. Takes her a leaves and go to live in a cottage with her granddaddy. She meets Colm who drives the milk cart with his horse Blue. There is an instant connection between the two and they become great friends. Cissy develops a crush on Colm. But, as Colm gets older he starts going out with a girl and Cissy is devastated. When Cissy becomes a teenager she is goes to work in a big house where a wealthy family reside. She meets the owner’s son Peter who seems handsome and friendly and is privileged. A completely different world to what Cissy lives. Cissy likes Peter and vice versa and others can see it too. They start secretly courting but If his parents found out Cissy would lose her job, and her family be shamed as they are both from different classes. People warn Cissy about Peter but she takes no heed and after a bout of sickness she realises she is in the family way. So instead of going home to her mother and telling the news, she lies to her and says she has a job in London. She then goes and has the baby, ready for it to be adopted. This is another five star read from Sandy Taylor. I have read all her books and she never disappoints. This drew me in and I loved it from the very first page. I couldn’t get enough of this story that I was reading this until 1am because it didn’t want to put it down. I loved each character especially Cissy at five years’ old she was so innocent and the story just flowed beautifully. Well done Sandy Taylor I will wait in anticipation for your next book. Thank you Netgalley and Bookouture for a copy of this book. This book is set in the early 1900's in Cork county. We meet Cissie who is being taken from the workhouse by her the mammy to live with her grandfather who smells like an old ferret. Cissie is not acknowledged by him as she is the product of a relationship out of wedlock. Cissie adjusts to her new life making new friends and talking "at" her grandfather until he begins to respond. I loved the characters in this book especially Cissie and Colm. The author has a knac Thanks to Netgalley for my copy. I loved the characters in this book especially Cissie and Colm. The author has a knack for injecting the right amount of humour into what is a bleak and poor existence. Cissie is introduced into a different way of life when she goes into service at the Honourables in the big house. Life takes her on some unexpected turns and we are carried along with Cissie on an emotional rollercoaster. Oh my heart. Outstanding. This is such a beautiful heart-warming and at times heart-breaking story. This touched my heart! I felt all the emotions while reading this story, happy, sad, angry, disappointed, hopeful, excited and worried. This book will be going straight into my top 20 of 2018. It was just such a stunning book with a beautiful ending. I absolutley loved most of the characters, especially Cissy and Colm! This story takes the reader back to the 1900s and is a story of Cissy’s life. Yo Oh my heart. Outstanding. This is such a beautiful heart-warming and at times heart-breaking story. This touched my heart! I felt all the emotions while reading this story, happy, sad, angry, disappointed, hopeful, excited and worried. This book will be going straight into my top 20 of 2018. It was just such a stunning book with a beautiful ending. I absolutley loved most of the characters, especially Cissy and Colm! This story takes the reader back to the 1900s and is a story of Cissy’s life. You get a good idea of the town and setting within the story! I devoured and lost myself in this book, a brilliantly written story that I found an easy read! It also highlights the closeness of friends, family and the community especially back in those days everyone knew each other! This story is set in Cork county, Ireland during the early 1900s. Six-year-old, Cissy Ryan, is walking out of the only home, she’s ever known; the Workhouse. A rather gruff woman who calls herself mammy, has Cissy by the hand all but dragging her away. Young Cissy is scared and confused as she has never met this woman before. She is taken to a little cottage where she meets an even gruffer and hostile, smelly old man. He orders the child out of the house. Time moves on and the household learns t This story is set in Cork county, Ireland during the early 1900s. Six-year-old, Cissy Ryan, is walking out of the only home, she’s ever known; the Workhouse. A rather gruff woman who calls herself mammy, has Cissy by the hand all but dragging her away. Young Cissy is scared and confused as she has never met this woman before. Time moves on and the household learns to get along and be satisfied and almost happy. Cissy befriends Colm Doyle, the milk delivery boy. Colm became one of her closest friends even though he is six years older. Moving ahead, Cissy is now a teenager and expected to work. She takes a job as a servant for a wealthy family. She is warned about the family’s son, Master Peter. He is handsome, charismatic, and privileged. Cissy had no business pining for him but how do you halt your emotions? The work is hard and everyone definitely is aware of everyone status and place in life here. Living in that home changes her life forever. By the time she left, she’d wish that she never met the charming devil, Master Peter or any of that family. I loved the colourful writing and the way the author incorporated the town’s dialect. Some characters you adore and some you abhor, just like real life. But, all and all, I loved the story. It’s well-written and thoroughly enjoyable. My only criticism is how everyone and most every situations came together happily in the end. I found that a bit implausible, but it felt good. Lovely lovely book, great characters and story line, heartbreaking at times but also heartwarming and sweet. I loved how Cissy used the terms 'the mammy' and 'the granddaddy' and her chatty lovely nature, especially her devotion to her best friend Nora who she grew up with in the workhouse until going to live with her family and then all the trials of growing up back in those times. Would highly recommend reading and Sandy Taylors previous books! I have read quite a few stories based on orphans and I can tell you this one did not disappoint. Sandy has a lovely way of telling this story. It had emotion and heart. I love a book that can make me teary eyed, it's hard to do! This one hit me in a few spots. I loved the character of Cissy, very full of life. The relationship between Cissy and the Granddaddy was so believable and the journey they shared was very heartwarming. I may have giggled a few times when they interacted in the beginning. I have read quite a few stories based on orphans and I can tell you this one did not disappoint. Sandy has a lovely way of telling this story. It had emotion and heart. I love a book that can make me teary eyed, it's hard to do! This one hit me in a few spots. I loved the character of Cissy, very full of life. The relationship between Cissy and the Granddaddy was so believable and the journey they shared was very heartwarming. I may have giggled a few times when they interacted in the beginning. Good book. A great look at how history was many years ago and how women were held as second class citizens. I wasn't expecting the twists and turns that this book took! The ending was a total surprise. I'll not give it away, but it really was one of those books where you'll think about it for a while to come. I look forward to reading more books by this Author! This book was so so so good! I loved everything about it. From when we first meet Cody’s to the last page. I loved how compelling and heart breaking her story was but also light hearted and happy at times. I absolutely adore Sandy’s books even if they do turn me into a bit of an emotional wreck. I couldn’t wait to read ‘The Little Orphan Girl’ and it appealed to me on so many levels, which I will explain a bit later on. All I can say on finishing reading the book is ‘Wow’. I absolutely LOVED it but more about that in a bit. I really, really felt for the character of Cissy Ryan. When we first meet her she is living in a workhouse. She hasn’t really known any different. One day her mother goes to the I absolutely adore Sandy’s books even if they do turn me into a bit of an emotional wreck. I couldn’t wait to read ‘The Little Orphan Girl’ and it appealed to me on so many levels, which I will explain a bit later on. All I can say on finishing reading the book is ‘Wow’. I absolutely LOVED it but more about that in a bit. I really, really felt for the character of Cissy Ryan. When we first meet her she is living in a workhouse. She hasn’t really known any different. One day her mother goes to the workhouse to ‘reclaim’ her daughter. The problem is that Cissy doesn’t recognise her mother and she doesn’t know her so going to live with her mother and her grandfather, who are two strangers to her, is a frightening prospect. The three of them learn to live with each other and relationships are built. Cissy blossoms in their care and I found myself chuckling at some of the things she said as she doesn’t have a filter so she comes straight out with some pearlers of lines. Cissy gets on well at school and she makes a life for herself. The time comes for her to leave school and jump into the world of employment. I found it heart wrenching to read about her leaving her mother and her grandfather and move on to the next stage of her life. I had to make sure I had a supply of tissues handy. I couldn’t help but hope that she would find the happy ever after that she so deserved. Will she find that happy ever after? Well for the answer to that question and more you are just going to have to read the book for yourself to find out because I am not going to tell you. I said that the book appealed to me on so many levels and now I had better explain in a bit further detail. I absolutely loved the fact that the book is set in Ireland. I have Irish ancestry and I feel an affinity with the Irish. Plus I have ginger hair which I put down to my Celtic roots. The other main reason that the book appealed to me was the fact that it featured an orphan who lived in a workhouse. I am a passionate fan of social history with a special interest in the whole workhouse system. Part of that is down to the fact that I also have a relative, who lived in a workhouse. Granted she wasn’t a child at the time but she did give birth to a baby boy whilst she lived in the institution. I always admired her courage and her determination because giving birth, living in a workhouse and then taking the child with you to live as a single parent in the 1870s were not easy things to do. My relative had previously been in prison, gave birth to a child and then the child went for an informal adoption. So double respect to her. Anyway that is enough about my family history so back to the review I go. Oh my giddy aunt this was one hell of an emotional rollercoaster read that certainly put me through the emotional wringer and then some. I am not usually one of those people who react so emotionally to a book but with this book I did. The author’s writing style is such that you can’t fail to be drawn into the story and before you realise you are hooked on the book. Sandy’s writing is so realistic that I could visualise the action taking place in front of me- it was as though I was watching a television drama. Her writing is so raw and so convincing that I empathised with Cissy and I literally felt every emotion that she went through. Reading this book soon became seriously addictive although at times I did have to put the book down. Not because it is badly written or anything like that but because I needed to recover emotionally from what I had just read. The pages of the book seem to fly past in a blur and it seemed like it didn’t take long at all for me to get through the book, but in reality it took a few hours. I was so focused on the story as well as being swept along by it that I didn’t realise just how quick the time was passing. I would pick the book up only intending to read a couple of chapters but that intention soon flew out of the window because I was so desperate to find out what fate had in store for Cissy. I was crossing my fingers and my toes that things worked out for her in the end. This is an emotional read of a little girl who had been orphaned and how she grew up. The story takes place in the early 1900s in Ireland where young Cissy, formerly named Martha, began her life in a workhouse. At the age of six she left the Union Workhouse with the new mammy. What a life she led until that point. It was all she knew and she thought she was very happy. Everything was now new to her and she was forced t Please see all of my reviews on my blog at www.robinlovesreading.blogspot.com. Despite her terrible start in life Cissy is determined to see everyone and everything in a positive light. She is naturally inquisitive and manages to make the best of what life can give her even when she finds herself wi Set in the early 1900’s in Ireland and told through the eyes of Cissy Ryan, the little orphan girl in the title. We follow her life from when she is reunited with her mother and leaves the workhouse, to her life in service and her eventual marriage to her childhood friend Colm. Sandy Taylor’s books give me the feels! Honestly, I knew that this book was going to make me cry and that I would love it even before I read it. This author just keeps coming up with the most beautiful, heart wrenching stories. Now I want to move to rural Ireland and find a nice Irish guy with a horse! Okay, not really but seriously though, I loved this story. Little Cissy has always known that she is an orphan. However, she suddenly finds herself with a quiet mommy and a grumpy granddad who does Sandy Taylor’s books give me the feels! Honestly, I knew that this book was going to make me cry and that I would love it even before I read it. This author just keeps coming up with the most beautiful, heart wrenching stories. Now I want to move to rural Ireland and find a nice Irish guy with a horse! Okay, not really but seriously though, I loved this story. Little Cissy has always known that she is an orphan. However, she suddenly finds herself with a quiet mommy and a grumpy granddad who doesn’t really want her around. As Cissy gets to know the two, her life begins to change. Soon afterwards, she meets the friendly Colm Doyle and his lovely horse, Blue. Cissy’s life later takes a dramatic turn when she starts working at Bretton Hall and meets ‘the honorables’. She is introduced to a different kind of life with people very different from those previously in her life. This is the kind of story that spans over a number of years. It begins with Cissy as a little girl and takes readers through her life to her teens and beyond. I loved this character! She was so nice though a little naive but I really wanted everything to turn out well for her. As a little girl, Cissy was so adorable and as she grew, the adversities in her life made her even more likeable. I can’t think of a single character that I didn’t like in this story, well apart from the obvious villains. Apart from the charming characters, the setting is also wonderful. I liked the rural Irish town where Cissy was raised. The neighbors, even the nosy ones were all interesting. The class divide added some angst to the story and contributed to the twists. I didn’t want this story to end and even after it did, I felt like hugging the book and just keeping the characters with me. I know, I know, hugging books is a bit out there but this one is seriously huggable. I have no doubt that the characters will stay with me, especially Cissy. Thank you Bookouture for the copy of this book to review, via Netgalley. I have never read any of Sandy Taylor's books and enjoyed her way with story telling ....I was captivated by Cissy. Cissy's story begins when she is just 5 and we follow her through her childhood and early adult hold. This book is sold as being "heartbreaking" and "gripping", I can honestly say I was gripped and was keen to get back to read more of Cissy's life. However, call me hard hearted, but I didn't find the story heartb Thank you Bookouture for the copy of this book to review, via Netgalley. This book is sold as being "heartbreaking" and "gripping", I can honestly say I was gripped and was keen to get back to read more of Cissy's life. However, call me hard hearted, but I didn't find the story heartbreaking.....maybe there are similar stories out that have educated us on the workhouse and beyond in Ireland of this era.. Certainly I was attracted to the book by this theme which I am learning about as part of discovering my own family history. And was pleasantly surprised to read of the kind and caring nuns that help Cissy down in London. I have only heard of nasty nuns that abused their cares....or maybe I am thinking of an era after this book was set in the early 1900's. Against all the odds, Cissy does show herself to be a kind caring girl. And luckily she was surrounded by loving family and friends. And her pure loveliness brought a lightness to her story and made me feel ever optimistic for her. What a lovely little nod to history near the ending too ....but I won't give away too much. I can't say how much I loved this deeply moving, beautifully written story about Cissy, The Little Orphan Girl, set in Ireland at the turn of the last century. We meet Cissy for the first time when she is just six years old and is collected from the workhouse by a stranger who tells her that she is her 'Mammy'. The first chapters captivated me as we see the world through the eyes of a child who has never stepped out of an institution. Having believed she was an orphan she now has to adapt to lif I can't say how much I loved this deeply moving, beautifully written story about Cissy, The Little Orphan Girl, set in Ireland at the turn of the last century. We meet Cissy for the first time when she is just six years old and is collected from the workhouse by a stranger who tells her that she is her 'Mammy'. The first chapters captivated me as we see the world through the eyes of a child who has never stepped out of an institution. Having believed she was an orphan she now has to adapt to life in the Irish village, and to a mother and grandfather, she never knew existed. My heart ached for the child who actually missed the workhouse and the people in it because that is the only home she knew. The book is highly atmospheric and the dialogue is so expertly written that you can actually hear the strong Irish accent when the characters speak. I loved reading about Cissy's journey through life from child to a woman. Her friendship with Colm is utterly adorable and Cissy even managed to warm the heart of 'the devil himself' her miserable grandaddy. Times were hard for Cissy, she faced prejudice and poverty but friendships and family helped her through. A thoroughly enjoyable, heartwrenching novel but also full of joy and love, truly hard to put down! Cissy spent the first part of her life as an orphan. To her surprise one day her mammy came and took her home when Cissy was 6. Her life takes a different path from there and it still will not be easy. This book had an interesting setting. I really liked the idea of the premise but there were some things I struggled with. 1. I found Cissy to be overly naive for being born out of wedlock in the early 1900's to an unwed mother. This girl seemed to be loved by everybody there is only one person in t Cissy spent the first part of her life as an orphan. To her surprise one day her mammy came and took her home when Cissy was 6. Her life takes a different path from there and it still will not be easy. 1. I found Cissy to be overly naive for being born out of wedlock in the early 1900's to an unwed mother. This girl seemed to be loved by everybody there is only one person in the story who does not love Cissy. She was a child born out of wedlock there would be more comments than was given through out the story. 2.Her side track love story was obvious of where it was going and proved Cissy was an idiot. The writing was on the wall when they met. 3. The title is very misleading. Cissy is never a real orphan which you find out very fast. The only surprising part of this story was Cissy's mom who was actually a good mom and thats because the title is misleading. Same with the description. I think Ms. Taylor put a lot of effort in the history but this was cookie cutter story with no real strife. I knew everything was going to work out. Ireland 1901 – When Cissy and her real mom are brought back together, Cissy’s life changes. But she’s not prepared for some of the changes she is faced with. The house she goes to live in is not grand and is inhabited by a grumpy old man she learns is her grandfather. Over time she changes her grandfather’s heart and they become fast friends. Along with her friend Colm, she learns to value herself and is confident she will become a better person. When an opportunity presents itself for employment for her at the grand Bretton House, she jumps at the chance. Surrounded by wealth and opulence, Cissy falls for false love and tragedy strikes. What can she do to fix her wrong and win back her one true love?